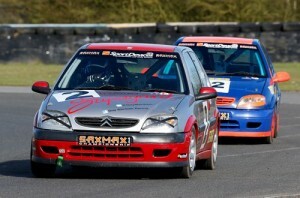 Tewkesbury based racing driver, Guy Wenham, 16, had an outstanding start to his 2013 season over the weekend at Croft Race Circuit in North Yorkshire. The Century Motorsport run racer from Kemerton, returns to the BARC SaxMax Championship after a very successful season in 2012 when he was Vice Champion. His aim this year is to go one better and take the title. Saturday morning saw Guy take pole position for both races, posting times 2.4 seconds a lap quicker than any other driver on the grid; an amazing achievement, as he had never driven the circuit before testing on the previous day. Race one was run late in the afternoon, a poor start saw Wenham drop back to third place off the line but by the end of the first lap he had made his way back to the front and from then on there was no stopping him, pulling away by more than 2 seconds a lap, he won by a 20 second margin over the next driver. Sunday afternoon saw Guy line up for Race 2, a much better start gave him the lead from the lights; a light shower during the race made the track a little slippery but undeterred he kept the pedal to the metal and took the chequered flag 12 seconds ahead of second place. Keep up to date with Guy’s season on Twitter @GuyWenham and on Facebook at Guy Wenham Racing.